Eight princesses from the UAE have been convicted of human trafficking and degrading treatment of their servants by a Brussels court. They were given 15-month suspended jail terms and ordered to pay €165,000 (£145,000; $185,000) each, with half the sum suspended. They were accused of holding more than 20 servants they brought with them on a 2008 visit in near slavery. But they were acquitted of the more serious charge of inhumane treatment. The princesses had denied all the charges. Their lawyer, Stephen Manod, said he was "satisfied to note that the Belgian justice has appropriately assessed this case which has generated many misconceptions for nearly 10 years". Sheikha Hamda al-Nahyan and her seven daughters did not attend the trial and rights activists said it was highly unlikely that the UAE would extradite them had they been jailed. The case came to light when one of the servants escaped from the hotel where the princesses had hired a floor of luxury suites. They said they were forced to be available 24 hours a day, had to sleep on the floor, were never given a day off, were prevented from leaving the hotel and were forced to eat the princesses' leftovers. But the case took nine years to get under way, partly due to legal challenges to proceedings by the defence. 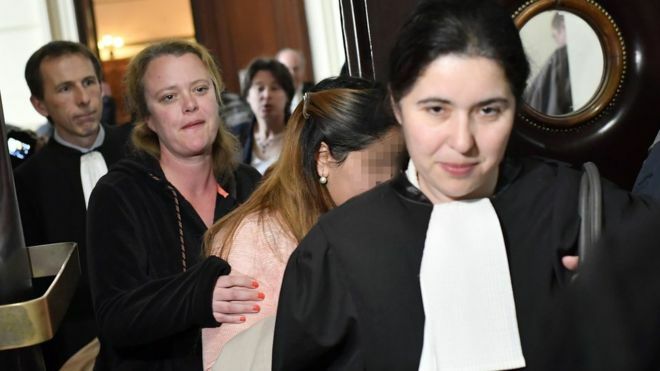 Myria, a Belgian rights group which helped bring the case to court, released a statement saying the case was "an important step in the fight against trafficking in human beings, which should not go unpunished". At the time of the trial, Nicholas McGeehan, an expert on migrant workers in the Gulf for Human Rights Watch told the BBC that it would be "hugely significant" if one of the wealthiest families in the world was publicly linked with trafficking and slavery. He argues that despite being abolished in law, domestic slavery continues in Gulf states - "perpetuated by ruling elites for whom it serves an important societal purpose in conferring status". He added: "It's top-down and tolerated."